Great taste 2013. Fruit free recipe. 7 wholegrains. Clean ingredients. No refined sugars. Non-GM. Award-winning. High fibre. No added salt. No artificial anythings. Vegetarian Society approved. 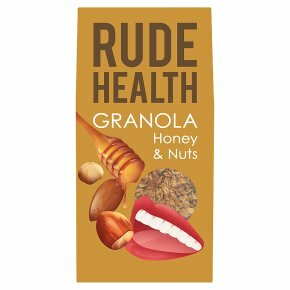 Kosher - KLBD.An every-morning treat packed with 7 whole grains Honey & Nuts Granola. Muesli's sophisticated sister. If Muesli is all wholesome country oats, then Granola is like Muesli that moved to the city and got all fancy. Oats got mixed up with roasted almonds, hazelnuts and a ménage of spelt and six exotic grains, and drizzled with honey. The whole things is baked with oh-so-chic unrefined cane juice sugar. It's satisfying, indulgent and up for it morning, noon and night. Wild not refined If you're going to have a bit of sugar now and then, make sure it's the best kind. That's why we use unrefined naturally sweet things like honey and the raw juice of sugar canes. That way you get all the nutrients and minerals alongside the subtle, natural flavour of cane juice sugar. How we like it Granola is so much more than a cereal. Use it as a topping on fruit and yoghurt, or add a bit of glamour to your regular brekkie. You can even turn into instant crumble topping. Or do what we do, and nom handfuls of it straight from the pack. As a nut nut, you'll love our new Nutty Crunch Muesli. It's got almonds, hazelnuts, sunflower and pumpkin seeds for a full-on crunchy mouthful.